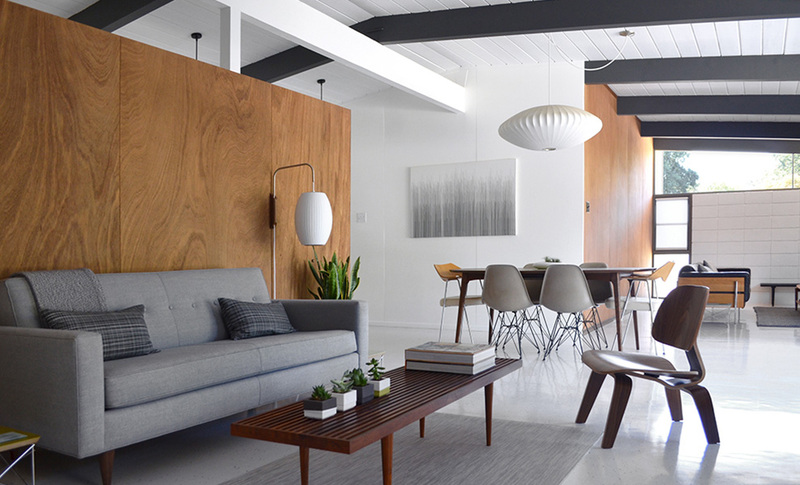 Modern design enthusiasts and professional DIY-ers Andy Lacey and Karen Ronneback share their ongoing restoration of their mid-century Eichler home in Sacramento’s South Land Park neighborhood. Before Andy and Karen set their sights on the west coast, they had already made a big leap across the pond from England to Boston, MA. The second time around, they took a different kind of leap—a leap of faith if you will—when they bought their current home, without even seeing the property (or Sacramento) in person. But what they did know was enough: The home was a 1955 four-bedroom property by famed developer Joseph Eichler, known for his flat or low-sloping roof lines, open floor plans, tall street-facing walls and panoramic windows to the backyard. 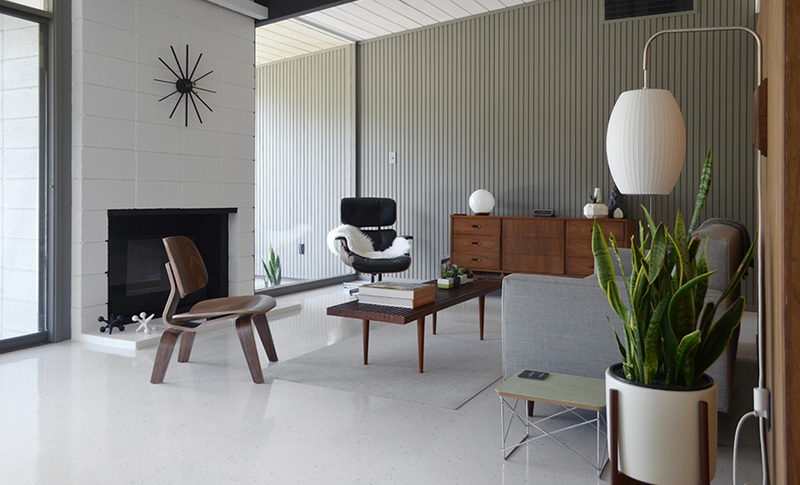 Did you always know you wanted to own and restore an Eichler home? Not exactly. We grew up in England, where most people have never heard of Eichlers, including us at the time. We’ve always liked modern architecture and design, but never dreamed of owning a home like this. Our last home was a Victorian townhouse, built in 1850. That didn’t stop us filling it with much of the same furniture we have now. But it fits much better in our Eichler. We quickly realized the west coast was a better fit for us, with more of the architectural style we loved, and much better weather. By that time, we knew all about Eichlers. We looked at the East Bay first, then discovered Sacramento’s South Land Park neighborhood. Tell us about your blog, FogModern. Where does the name come from? Though it may seem abstract, “fog” refers to winter tule fog in Sacramento and summer coastal fog in the San Francisco Bay Area. This represents our geographical focus, though that sometimes extends to SoCal. “Modern” simply describes the style of architecture and design that we obsess over. We created FogModern to document our restoration, while showcasing other MCM homes and neighborhoods. We also wanted to connect with fellow Eichler homeowners and fans of modern design. And that’s precisely what we’ve done. We’re now part of a passionate community, and we’ve made some great friends, throughout California and beyond. How did you first envision this project? We completely underestimated the size of the task. We’ve renovated multiple homes in the UK, but nothing on this scale. Then again, everything is smaller there. It’s actually been a series of big projects, making up one giant project! We’ve been working on the house for three years now, on most weekends, many evenings, and some weekdays. While we’re now “done” enough, we’re far from finished. Luckily, it’s our hobby and our passion, so that suits us just fine. Our design decisions are mostly guided by our own home. 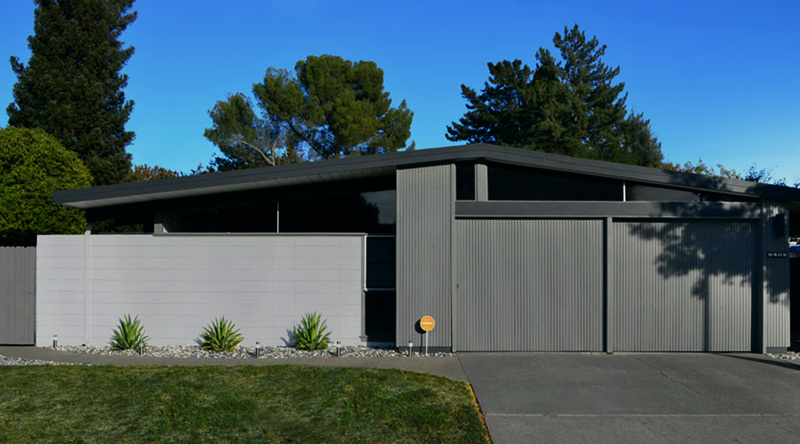 We’re passionate about preserving or restoring original details, and respecting the intent of Eichler’s architects. When we do make changes, they are sympathetic to the original design. Comparing neighbors’ homes is helpful in determining how things should look. We love looking at old Eichler photos, by Ernie Braun, Julius Shulman and others. 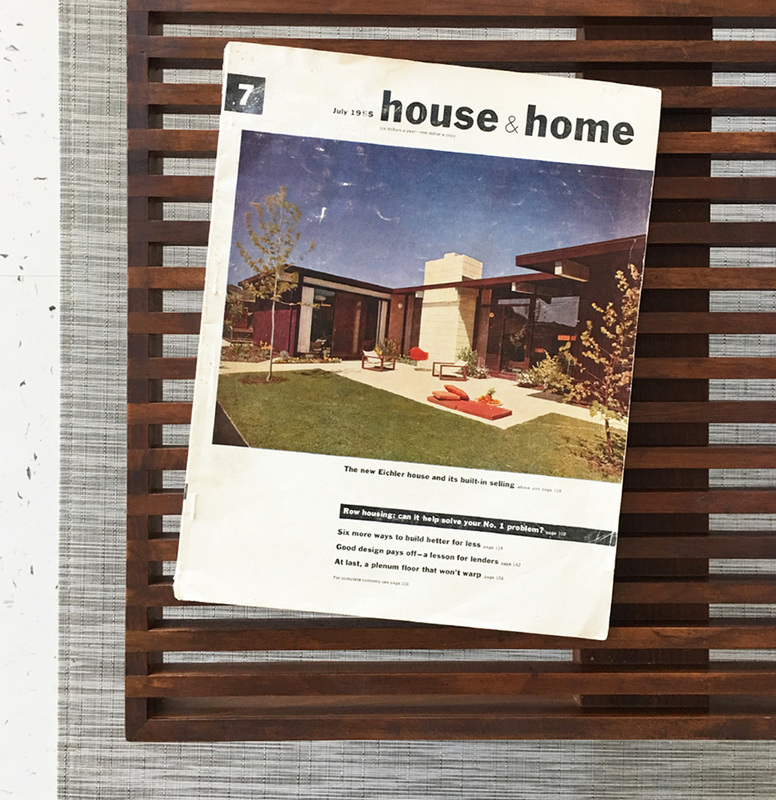 We have a 1955 issue of House & Home magazine, featuring an almost identical model to ours. It’s wonderful to see “our” home as originally intended. Everything here feels so well curated and thoughtfully put together. How do you know if something will “work” in your home? And, any favorites? We pick mostly mid-century furniture, so it naturally fits our 1955 home. We keep our color palette simple and minimal–white, gray and wood. We punctuate this with occasional bright color accents. That said, it was anything but simple for us to finalize our scheme. It took us more than a year to find the “right” gray for the siding. We have lots of favorite pieces. We brought our leather Forum Sofa and 675 series chairs (either end of dining table) all the way from England. They were designed by Robin Day, regarded as the British equivalent to Charles Eames. We also love our bargains. The large George Nelson saucer was $75, the Plycraft lounge chair was $35 and our Lane surfboard coffee table was $30. We recently added a Nelson Cigar sconce and walnut-base Lotus floor lamp, which we adore. Your style obviously lies somewhat in the mid-century, but your home feels more modern than retro. How do you bridge the MCM era with a look that feels right at home today? Our style is definitely on the modern side of mid-century, and informed by our European roots. It’s a good fit for Eichlers, which feel more ‘modern’ than most homes being built today. That said, we incorporate many mid-century elements, from furniture to the home itself–we’ve restored wood paneling and preserved the original 1955 kitchen and bathroom cabinets. What makes it feel modern is the minimal color palette, and abundance of white, on the walls, ceiling and floors–though the flooring is actually period-appropriate VCT (vinyl composition tile). We also keep clutter to a minimum and don’t hang much artwork. Not to everyone’s taste, but this allows the architecture to breathe. Eichlers have such clean lines, expansive glass and a rich blend of materials. That’s why we love them, so we try not to detract from that. Any new projects you are currently working on? Yes, a couple ongoing. We are adding a secondary front door and fence, to create a private courtyard entry. We’ve clad the fence in Eichler siding and painted the same gray as the house, so it looks almost original (we hope) from the street. We installed our favorite Spore doorbell, and now just need to add the door, which we’ll paint in our green accent color. We’re also working on our final untouched bedroom. We’re painting, installing flooring and restoring another wall of wood paneling. This will become a reading and music room, housing a drum set we recently bought and a turntable or vintage console we plan to buy. We’re pretty excited about it. After that, there’s the master bathroom, our dumping ground of a garage and more landscaping. Lots of work ahead. What advice can you offer for someone taking on a similar project? Tread carefully. Live with things a while before making changes–you hear this advice a lot, but with good reason. Most people buy a home, immediately throw money at it and make wholesale changes. You need to gain a true understanding of the space and how it lives. That’s not to say you can’t make changes, and we certainly have, but they should be well considered. Prepare for everything to take longer and cost more than you think. That’s just how it is. And there’s nothing wrong with admitting defeat. If things don’t go to plan, it’s fine to start again, or ask for help. We DIY pretty much everything, but sometimes you need professional help. Most importantly, sit back, relax, and enjoy what you’ve done. After all, homes are for living. Joseph Eichler was an American developer who built around 11,000 homes in California, making his own mark on residential modernism. In 1955, 60 Eichler homes were constructed in the Sacramento South Land Park neighborhood alone. 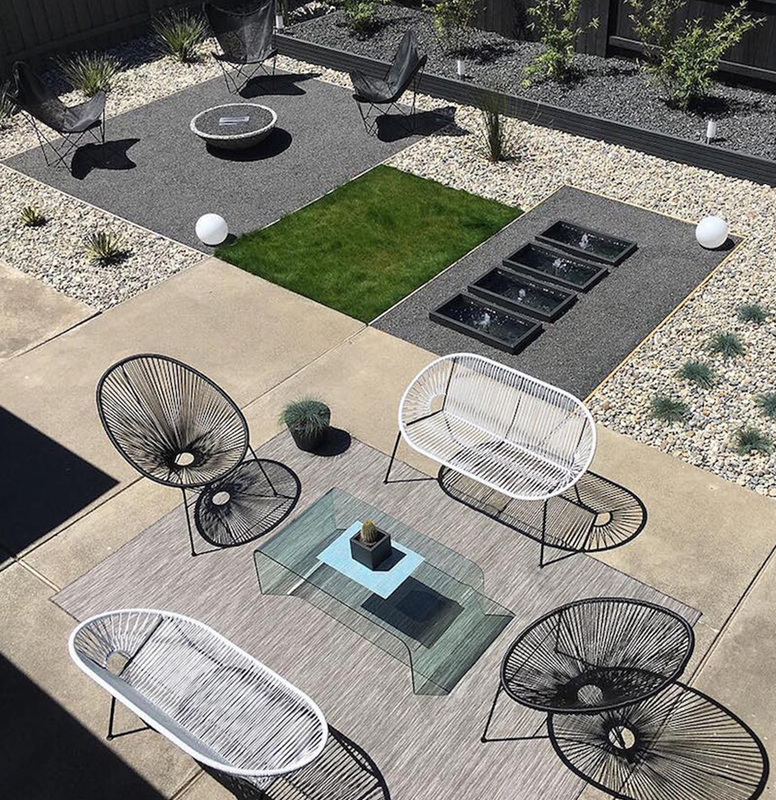 With their distinct flat or low-sloping roofs, high street-facing walls and floor-to-ceiling windows in the back, Eichlers took their place as a distinctive branch of mid-century modern that is still sought after today.